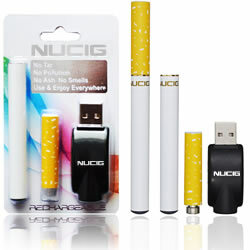 White electronic cigarette mini kit buy from NUCIG UK. Recommended by our new stage manager for our show production. Very effective and perfect in every way. I head the props team at a well known London theatre company and we where looking for realistic looking cigarette props. This company was recommended by a friend who is in the same business ( based in Australia ). The kits received have surpassed all my expectations and have really impressed all those who have used them in our shows. Its amazing how they light up and exhale "smoke" and all without nicotine or other harming by-products. Well come back for more as when needed. Update to the review below. The company has contacted me with apologies for the faulty product. And explained that due to technical problems I had not recieved an answer from them. They have sent a replacement to me that arrived super quick, and have been very helpful in rectifying this problem. I must say, it was great after sales care. Very well handled, nice personal touch. I bought the advanced Pro4 mini kit & a cigar. The cigar works fine, however the cigarette from the advanced kit does not function. I have tried charging it but still nothing. I have sent three 3 emails to the company and so far I have had no response. The number they want you to call is also a premium rate number, so beware. The cigar works fine and is a good product and if the cigarette worked I'm sure it would be too. I can not recommend this company to anybody though due to it's apparent bad customer service. I for one will buy elsewhere in future. Due to a recent server upgrade ( to speed the site up and offer improved user web experience ), we have had technical issues which prevented our teams from seeing messages for whch we are very sorry. Although very rare, problems can occur during the manufacturing process and products can be affected or damaged during delivery/transit. At NUCIG we make it our mission to resolve all problems, quickly and efficiently - we are so sorry our technical issues prevented an early resolution in this particular case. One of our senior team members has now reached out to you and we are glad to hear you are satisfied with the resolution offered. 100% realistic, very effective for our shows. The realistic cigar version is also highly recommended. Great for our theatre products !